Eppa Hunton II (September 22, 1822–October 11, 1908) was a US representative and senator from Virginia and a brigadier general in the Confederate army during the American Civil War. Hunton was born near Warrenton, Virginia, on September 22, 1822, to Eppa Sr. and Elizabeth Mary (Brent) Hunton (married June 22, 1811, in Fauquier County), who had twelve children in all. After graduating from the New Baltimore Academy, he taught school for three years, then studied law and was admitted to the bar in 1843, commencing practice in Brentsville, Virginia. He became prominent as a colonel, and later brigadier general, in the Virginia militia and as a Commonwealth attorney for Prince William County (1849–1861). In 1848 Hunton married Lucy Caroline Weir (February 20, 1825–September 4, 1899), daughter of Robert and Clara Boothe Weir. They had two children, Elizabeth Boothe Hunton (June 20, 1853–September 30, 1854) and Eppa Hunton III (April 14, 1855– March 5, 1932). In February 1861, Hunton was a delegate to the Virginia Secession Convention and advocated secession. With the outbreak of the American Civil War, he was commissioned a colonel of the eighth Virginia Infantry of the Confederate army, participating in the first battle of Bull Run in July. In October his regiment was part of Nathan G. Evans’s brigade near Leesburg, Virginia, where he led his command against a Union force at Ball’s Bluff, driving it into the Potomac River. Afterward Hunton held brigade command in Lt. Gen. James Longstreet’s corps, Maj. Gen. George Pickett’s division, and the Department of Richmond, being promoted to brigadier general in August 1863, after the Battle of Gettysburg. During Pickett’s Charge, Hunton was wounded in the leg. After service in the defenses of Richmond, he rejoined Pickett’s division and fought at Cold Harbor and in the Richmond and Petersburg siege lines. In March 1865, his command fought a delaying action at Five Forks and again the following month during the battle of Sayler’s Creek, where he was captured on April 6, 1865. He was paroled at Fort Warren, Massachusetts, on July 24. After the war Hunton resumed his former law practice and became involved in politics. He was elected as a Democrat from Virginia to the Forty-third and the three succeeding Congresses (March 4, 1873 – March 4, 1881). During his years as a representative, Hunton was chairman of the Committee on Revolutionary Pensions (Forty-fourth Congress) and the Committee on the District of Columbia (Forty-sixth Congress). 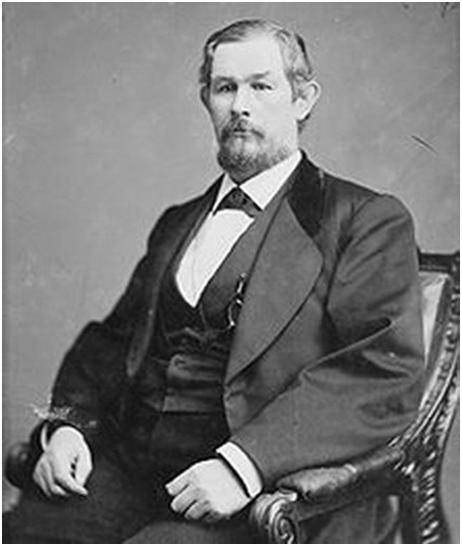 He was appointed to the fifteen-member Electoral Commission created by an act of Congress in 1877 to decide the contests in various states in the presidential election of 1876. Hunton was not a candidate for renomination in 1880, instead resuming the practice of law. He was appointed and subsequently elected as a Democrat to the US Senate to fill the vacancy caused by the death of John S. Barbour, and he served from May 28, 1892, to March 4, 1895. Hunton served as chairman of the US Senate Committee to Establish a University of the United States from 1893-1895. On or about April 1, 1894, Hunton became indirectly involved in voting bribery attempts. Charles W. Buttz, a lobbyist and claim agent originally from North Dakota but living in Washington, DC, went to Hunton’s house in Warrenton, Virginia, during the senator’s absence. Buttz told Hunton’s son Eppa III that he would pay him a contingent fee of twenty-five thousand dollars if he would, by presenting arguments as to the pending tariff bill, induce his father to vote against it. Buttz also attempted to bribe South Dakota Senator James Henderson Kyle to vote against the same bill. Hunton and Kyle were eventually exonerated from all blame. Afterward Hunton again resumed his law practice in Warrenton, Virginia. On October 11, 1908, Hunton died in Richmond, Virginia. Sources of information: The Trenton Times, Trenton, New Jersey, May 26, 1894. Hunton, Eppa. Biographical Directory of the United States Congress; the Autobiography of Eppa Hunton. Richmond: William Byrd Press, 1933. Detailed biography taken from Confederate Military History, Vol. III. "The Frederick Douglass Papers," speech from December 13, 1894, on the Bill (S. No. 1708) to Establish the University of the United States.